An Irish reform group has called for the laity to be involved in the selection of new bishops for Irish dioceses. In a statement, We Are Church Ireland highlighted Pope Francis’s call for the laity to be involved in the Church’s decision-making. They also noted that one third of the Irish Church’s 26 dioceses do not have, or are awaiting, the appointment of a new bishop. These include the Diocese of Dromore, where Bishop John McAreavey’s resignation was accepted by Pope Francis in March 2018 after questions were raised over his handling of a priest who had abused children. The Diocese of Achonry has been without a bishop since Bishop Brendan Kelly was installed as Bishop of Galway in February 2018. In recent weeks, Bishop Leo O’Reilly of Kilmore announced his retirement for health reasons. Meanwhile, Bishop John Kirby of Clonfert has been waiting for a replacement since he submitted his letter of resignation to Rome on reaching the age of 75 in October 2013. Bishop John Buckley of Cork and Ross also submitted his letter of resignation in 2014. Later this year, Dublin’s auxiliaries, bishops Ray Field and Eamon Walsh are due to retire and in 2020, Archbishop Diarmuid Martin of Dublin and Bishop Denis Brennan of Ferns both reach 75. In their statement, We Are Church Ireland said these vacancies are an “opportunity for the Church in Ireland to lay new foundations”. 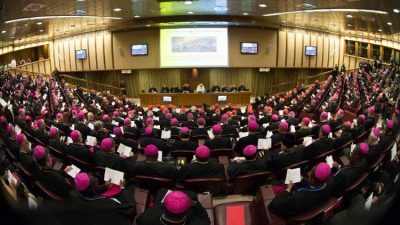 They warned that the opportunity “will be squandered unless the people of God are involved in the selection of future bishops, who will determine the future direction of the Church”. They urged the faithful to contact the Papal Nuncio, Archbishop Jude Thaddeus Okolo, suggesting the criteria they believe is necessary for the selection of future bishops and nominating potentially “charismatic and prophetic leaders”.